Despite throwing big stickers on the side of Red Bull F1 cars, Infiniti has struggled to make an impact in the UK. The luxury brand from Nissan was billed as a rival to Lexus, but has so far failed to ignite much interest. Show the average person on the street a picture of an Infiniti and they're unlikely to recognise it. In fact last month Infiniti registered just 25 cars in the UK, which tells you all you need to know. Not that Infiniti is aiming to be a mainstream brand - it's happy to carve out a niche - but even then it needs to sell cars, especially here in the UK. 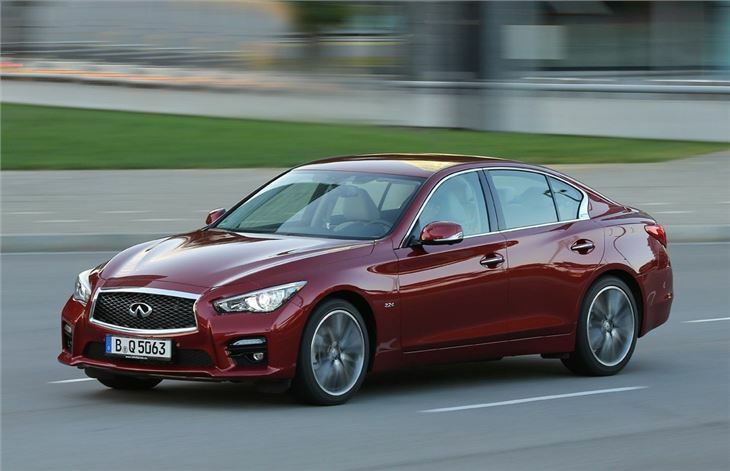 And the new Q50, a BMW 3 Series size saloon, is the first step in a plan that will see the Infinti range more than doubled in the next five years with twice the number of engines available. Given that Infiniti wants to make more of an impact, it's somewhat of a surprise that the Q50 is fairly generic in its design. There's more than a touch of Lexus at the front while the back is reminiscent of the latest Mazda6. The brand claims that it wants to be different from other premium brands when it comes to styling, but the Q50 is inoffensively ordinary. It's a similar story inside. There's no doubting the quality nor the attention to detail in the finish, but it lacks personality. The new touchscreen control - called InTouch - is good though and works like a smartphone with a similar controls and the ability to download apps. You can even get your emails on the move thanks to a text-to-speech function and sync with your Google calendar. However, elsewhere there are no special touches or neat features that mark the Q50 out from competition. It certainly doesn't feel particularly modern or stylish, especially if you compare it to the latest Lexus IS. On the plus side it does have impressively comfortable seats - designed using NASA research - and plenty of space, although taller passengers in the back will find their head brushing the rooflining. 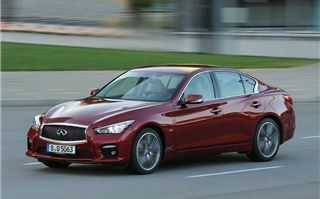 The G saloon was hampered by the lack of a diesel engine, but Infiniti isn't making the same mistake with the Q50; it comes with a new 2.2-litre diesel engine. Well we say new, it's actually a Mercedes-Benz unit that's used across a wide range of models from the SLK to the M-Class. In the Infiniti it develops 170PS, but more impressively has 400Nm of torque which peaks from just 1600rpm. In theory this should mean strong performance and while it's not sluggish, it's not a refined or quiet engine, so utilising that power is far from a pleasant experience. Compared to similar sized diesel engines from Audi, BMW and Jaguar, it seems coarse. We only had the opportunity to drive it with the optional seven-speed automatic rather than the standard six-speed manual. While the auto offers reasonably smooth changes, it doesn't shift gears very quickly meaning the overall driving experience often feels strained. The one thing the 2.2d has going for it is economy. It averages a claimed 64.2mpg with the manual gearbox, which means emissions of just 114g/km - impressive figures for a car this size. 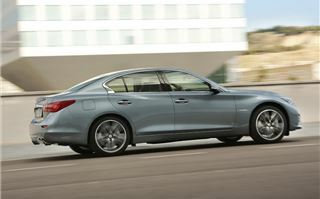 The other model in the Q50 range is the Hybrid, which is available with four-wheel drive. Powered by a 3.5-litre V6 petrol engine combined with an electric motor, it's the quickest mainstream hybrid on the market, managing 0-62mph in just 5.1 seconds. It's the same hybrid system that's used in the M35h, but the seven-speed automatic gearbox has been tuned to improve performance. As a result it's a very different hybrid than we've become used to. There's no CVT gearbox so you don't get that odd continuous whine whenever you accelerate. Instead it sounds genuinely sporty with a nice exhaust note and a strong V6 sound. It doesn't feel quite as quick as the figures suggest, but it's certainly no slouch. The advantages of the hybrid system are also evident in economy - a claimed 45.6mpg with CO2 of 144g/km from a car with more than 360PS. The Q50S Hybrid also comes with Direct Adaptive Steering - the world's first electronic steer-by-wire technology. That means there's no physical connection between the steering wheel and the steering rack (although there is a traditional column in place as a safety back-up in case the system fails). The theory behind it is that by getting rid of the mechanical losses in a conventional system, the steering response is faster and vibration at the steering wheel is made non-existent. It sounds clever but what's it like in practice? Well, it's better than the standard steering system on the 2.2d which lacks feel and response. With the Direct Adaptive Steering you can alter both the weight of the steering and the responsiveness from light and casual to heavy and direct. In the latter it feels mighty strange for a saloon and is almost too direct. Opt for an in the middle setting and it's better, although it still feels very artificial and doesn't imbue you with the same confidence in corners as rival saloons. It's an interesting system to play with but you do question why they can't just make the standard steering set-up good in the first place, maybe with a sport setting to add response. In short it seems over complicated. In terms of price, the Q50S Hybrid is £40,000 - around the same as a BMW ActiveHybrid 3 - and it comes well equipped as you'd expect with pretty much every bell and whistle you'd want. Opting for the all-wheel drive model adds a further £1625. The 2.2d on the other hand starts at £27,950 - slightly cheaper than an equivalent Audi A4 and considerably less than a Mercedes-Benz E-Class with the identical engine. The Q50 is a decent effort by Infiniti and certainly an improvement on the G saloon it replaces, but there's little that makes it stand out and nothing to really recommend it over a competitor car.